Without question, the experience was one of the highlights of my writing career to date. It was only when the cast and production team began to assemble in the Green Room that the truth fully hit me: my words were actually going to make it onto the airwaves. The play has a four-part, all-female cast and we were thrilled with the stunning line-up of actors: Susan Lynch, Leanne Best, Rachel Austin and Eileen O’Brien. I loved hearing their responses to the script. Their reflections on its meaning, on which accents to adopt, and on their characters, were carefully thought-through. They’d each done their homework; there was something enormously humbling about that. We started with the read-through. I was aware of Nadia (Molinari, my Producer) trying to catch my eye as the actors delivered their lines. Actually, I was too overcome with nerves, and too much in awe at the process of the words coming to life, to look at anybody. By the end, though, there was a collective sense of excitement in the room. There was a wonderful dynamic between the characters. The actors had been touched by emotion in places I hadn’t thought they would be; and they laughed much more than I’d expected. Result. It was my first ever time in studio so, as recording began, I was amazed to see behind the scenes and how the studio managers went about creating the effects. At one point, we had to reconstruct a church congregation. Nadia roped in everyone so we could sound like a full congregation of nuns (everyone except Steve, that is, the sound manager who had to record us and would probably, anyway, have sounded out of context). The line – ‘Lord, gracioiusly hear us’, the response to the bidding prayers – is a familiar one from my Catholic past. I never dreamed though, standing in church as a child, that I’d be uttering it one day in a radio studio. Or that I’d get to read a line in my very own play. One of the most illuminating things was the insight into the technical, behind-the-scenes process. I hope it’s not ruining the illusion of radio too much if I tell you that there is a staircase with four different surfaces (wood, carpet, metal and stone) for recording characters ascending or descending stairs. Although in writing the script, I’d had to think about the play’s soundscape and how to tell the story through action, until then I’d been focusing on the words on the page. Being in the studio added a whole new dimension. Putting the play on its feet meant that we could hear where the movement didn’t work. Did the actors move in the wrong place? Should a letter be exchanged between the characters at an earlier point in the scene? And, here’s the thing. Unlike fiction, where it’s simply me and the page, in radio drama the piece goes on being written and shaped beyond the (allegedly final) printed script. Firstly, in the read through, the play had come in slightly over time (when taking into account the music – a haunting and melodic plainsong which is vital to the soundscape of the piece). We knew we had to sharpen it up. So, as the actors rehearsed each scene before the record, I was poised with a pen to gut it. Out came redundant words and sentences. Out came bits that were too awkward for the actors to deliver – I know now that it’s a sign that the writing isn’t working. This process of writing and rewriting and on-the-spot editing taught me that the authorship of the piece is so much more fluid and organic than in fiction. Nadia suggested changes; the actors suggested changes. The whole thing is a constant work-in-progress; certainly, until the end of the recording. Even, until after the editing, during which even more could be cut. Even, possibly, during the broadcast, when the audience will bring a whole new layer of interpretation and meaning. I knew I’d be excited about the recording experience. I knew I’d love it. And so I did: it took me days to come down from the adrenaline high. But the main reason for my insomnia (on both nights after we’d finished recording) was an awareness of the thin line between story and actuality. I kept hearing the words of the actors, resounding in my head, reciting my lines. It was strangely unsettling, but also rather wonderful. As though, after all those months of me making stuff up, the words had somehow crossed into the real world. That ‘reality’ was an enclosed order of beautiful, cloistered souls, populated by Susan, Leanne, Rachel and Eileen. Off the page, before and after the recording, some strange things happened which illustrated this strange intertwining of the real and the fictional. The story of the play seemed to chime with the lives of some of the actors: one has a sister who is a nun, and was taught by nuns herself; another has a friend who is an ex-nun. They brought these experiences with them to the parts they played, and I’m sure that the drama is all the richer for it. 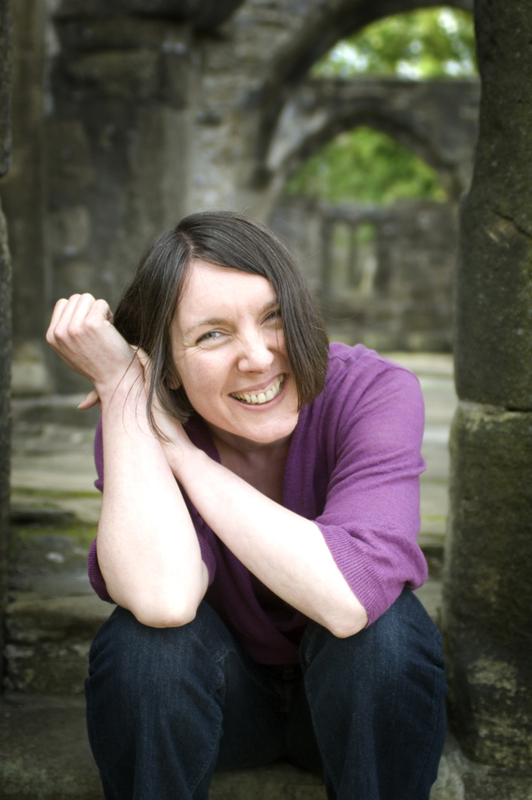 Immediately after the recording, on the train back to London, Leanne tweeted that there was a nun – dressed in full regalia – in her carriage. Was it one of the characters? we asked her. She said that she was too spooked to ask. 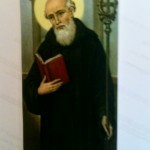 And one other strange thing: days before the recording Nadia had bought a prayer card of St Benedict. Without wanting to reveal too much of the story, the card is significant to the plot of the play. Having bought it, Nadia then couldn’t find it. It remained lost until a couple of days after the recording, when it turned up again in a way that directly copied what unfolds in the play. 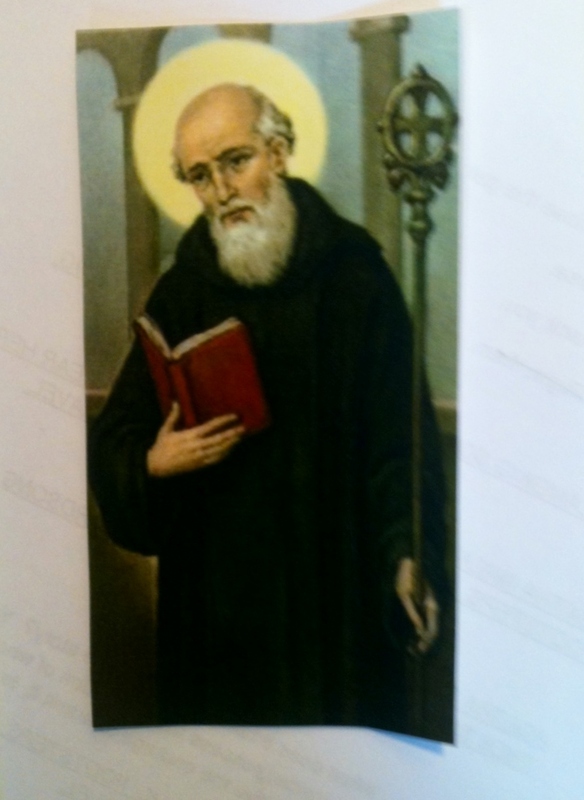 Of course, this could be the spirit of St Benedict, patron saint of scholarship, at work. But I prefer to think of it as the energy of the play itself, reverberating beyond the page, beyond the story and the studio, into the lives of the audience. 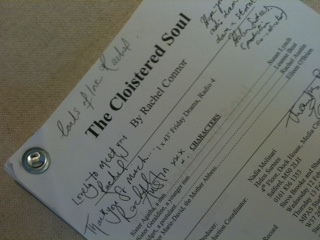 *The Cloistered Soul will be broadcast on Radio 4 at 2.15 on Thursday 29 May. Rachel. 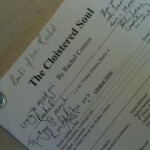 I forgot to mention earlier that I did listen to The Cloistered Soul on catch up a few days after it aired. I enjoyed it very much, although radio plays are not my usual kind of thing. Once again, the richness of the fully believable characters was what stood out for me. Really engaging. Ah, thanks so much, Pete. I’m really glad you enjoyed it. I’m sure there’s a lot of playing out of ideas and beliefs and opinions from school days – you may have noticed! But mainly I just wanted to create characters that surprise and a story that would keep people interested. Thanks for letting me know your thoughts on it – messages like that really help to keep me going when the writing gets tough.